Roger Tuivasa-Sheck has no desire to fill the hole in the Warriors halves left by the departure of Shaun Johnson. After Johnson was released by the club late last month, suggestions have been thrown around about who might replace him. Tuivasa-Sheck's name has come up in the conversation, but the reigning Dally M player of the year told the Radio Sport Breakfast he wasn't a likely option. "At this stage I'm playing fullback," Tuivasa-Sheck said. "That's the position I prefer to play. I think a lot of the boys, we like to joke about it and say I'll move into the halves, but I don't see myself there. "[I'll] just stay at the back and catch bombs." While the question remains whether or not the side will look to bring in a tested first-grade half, the Warriors have a number of players already on the books that could fill the vacant spot. Talented youngsters Chanel Harris-Tavita and Hayze Perham could make a play for the spot during the pre-season, as could 21-year-old Adam Keighran who joined the club this year from the Penrith Panthers. Of their experienced first-graders, centre Peta Hiku would be the likely choice to fill the role, having played in the halves intermittently throughout his NRL career. 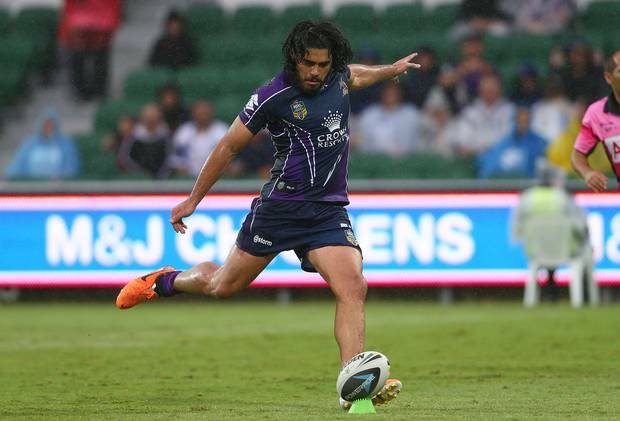 However, second-rower Tohu Harris could be considered for a temporary shift to the halves. While best utilised in the forwards, Harris' playmaking and kicking ability has been well displayed in the past, and he has playing in the halves during his NRL career as well as on the international stage. So, while Harris-Tavita, Arona and Keighran get up to speed, Hiku or Harris could find themselves lining up alongside Blake Green. However, Tuivasa-Sheck believes there's plenty of time before the season begins for the young players to show they're serious candidates for the vacant position. "We've still got quite some time in the preseason, so if they can look to impress the coaches and maybe they'll get that start. "Then if the recruitment manager and the coaches believe they need to bring someone in, that's in their hands."